Jane Austen has been confirmed as the next face of the £10 note in a victory for campaigners demanding female representation – aside from the Queen – on the country’s cash. He also announced that the Bank would carry out a review of the process for selecting the historical figures who appear on banknotes, to ensure that a diverse range of figures is represented. And are the petitioners happy? Campaigners threatened to take the Bank to court for discrimination under the 2010 Equality Act and launched a petition on the campaign site Change.org which secured more than 35,000 signatures. Caroline Criado-Perez, co-founder of feminist blog the Women’s Room, who led the campaign, and was called in to discuss the issue with Salmon, said the Bank’s announcement marked a “brilliant day for women”. “Without this campaign, without the 35,000 people who signed our Change.org petition, the Bank of England would have unthinkingly airbrushed women out of history. We warmly welcome this move from the Bank and thank them for listening to us and taking such positive and emphatic steps to address our concerns,” she said. The only other women to be ever be depicted on bank notes are Elizabeth Fry, a prison reformer, and Florence Nightingale. 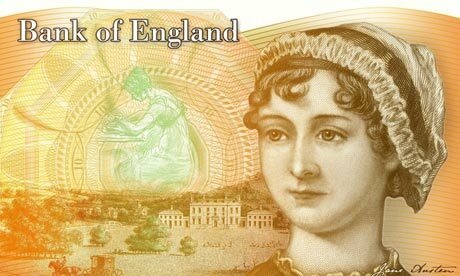 Austen will take her place on the £10 note in 2017, the bicentenary of her death, replacing the 19th-century naturalist Charles Darwin, who has been on the notes since late 2000. Criado-Perez conceded Austen was not top of her wish-list as the next woman on a bank note but that she was a particularly apt choice given the context. “She was an incredibly intelligent woman. She spent her time poking fun at the establishment. All her books are about how women are trapped and misrepresented. It is really sad that she was saying that 200 years ago and I am still having to say that today,” the campaigner said. So is there any controversy? Yes. The quote to appear on the banknote is not one that many would pick. The trouble is that these words are spoken by one of Austen’s most deceitful characters, a woman who has no interest in books at all: Caroline Bingley. She is sidling up to Mr Darcy, whom she would like to hook as a husband, and pretending that she shares his interests. He is reading a book, so she sits next to him and pretends to read one too. She is, Austen writes, “as much engaged in watching Mr Darcy’s progress through his book, as in reading her own” and “perpetually either making some inquiry, or looking at his page”. He will not be distracted, so “exhausted by the attempt to be amused with her own book, which she had only chosen because it was the second volume of his”, she gives a great yawn and says the words that will appear on the bank note. For anyone who has actually read “Pride and Prejudice”, Caroline Bingley is one of the characters you like to dislike. And she never reads anything. The sentiment is wonderful, but does the Bank of England really want irony on its banknotes? Austen wrote often about money: Having it, not having it, marrying for it, being married for it. I’m sure they didn’t want a quote about money. But the one they picked is almost as bad. I think it is time for them to consult some Austen scholars or even have ask people to submit their favorite quotes. And while I’m thinking about it, if they had adopted the Euro, this discussion would never have happened. Makes me happy. This entry was posted in Books, Culture, Fiction and tagged Bank of England, Books, Jane Austen, literature, Pride and Prejudice. Bookmark the permalink.